Spring is coming. And I love farmer market at spring. Berries! of course some other lovely fruits as well, but berries is most favorite for me. And it means I'm gonna make some pies these weeks. Yup.. light, healthy and yummy dessert. That's why today I make some flaky pie crust in ahead. 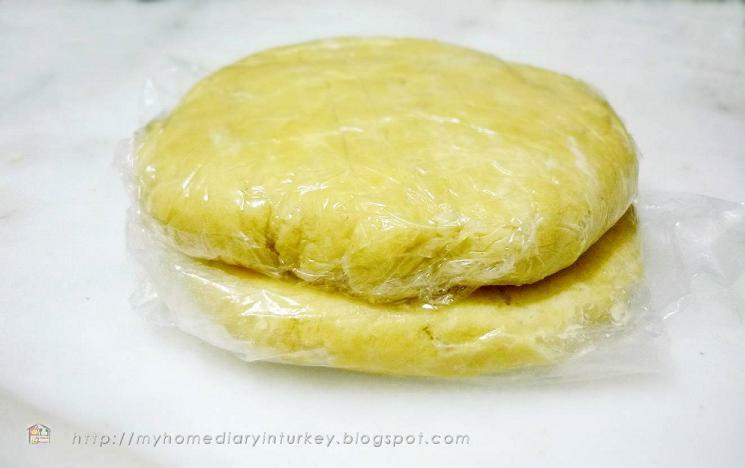 I use all butter and no shortening for my pie crust because it's very hard to find shortening in local market. If you want to mix this recipe with shortening, use 50:50 of butter and shortening. Make sure to use good quality of butter cause it really affect the taste and the smell. I use traditional homemade butter for my recipe--just like I always did. It's very much satisfied me. I bought my butter from local farmer market in my neighborhood. Unlike from my previous pie crust, today i make it manually, no food processor. I just want to taste the different of using processing and manual way. But for you who want to make it with food processor, you can scroll down a bit to see how to make with processor. Homemade Chicken Nuggets. KID'S FAVORITE! Resep dalam Bhs İndonesia ada di Bagian bawah. Selam every one...Merhaba from Turkey. Are you "facebookholic"? ... Sorry for my term. I mean do you often read the news story on front wall shared by your facebook friends and all of sudden you find your self on somewhere inside cyberspace....It is fun, but sometimes we forgot how long we've been there ... oh..no..no..no..If already at that stage where we forget the time ... stop it. Off-connect and re-connect with the real world. A few days ago, I accidentally read a news feed Shared by a friend on FB about dangers of preservatives in food-which is impossible may not be used in the fast food industry or frozen food. yeahhh... of course in their advertisement they will not mentioned or even denied it.. Do you believe that? To be frankly, before marriage and life as a single, away from my family, ready meals and frozen nearly my every day menu. At that time, of course I am aware of the dangers of the materials x, y, z which might be in these foods, not to mention the quality of the ingredients used, whether fresh or good condition and so on. What to do, I live alone, cooking was a big effort for me ... maybe you understand what I mean. But after getting married ... I changed completely. Not only health reasons I mentioned above, also is more economical, and there's "romantic bonding" when my husband and I ate my cooking or his cooking ...or sometimes we cook together at the weekend ... And when my child comes in our life, giving her the best in all things is our obsession-including her meals. Anywwaaaayyy.... with homemade meal, you can control the ingredients you use.. quality and price... And heyy.. homemade is cheaper! Resep dalam bahasa Indonesia bisa dilihat disini. In Turkey, pita (called pide) has a soft, chewy texture. The pizza-like foods called lahmacun are made with oval-shaped pieces of pide dough topped with finely chopped meat and herbs before baking. 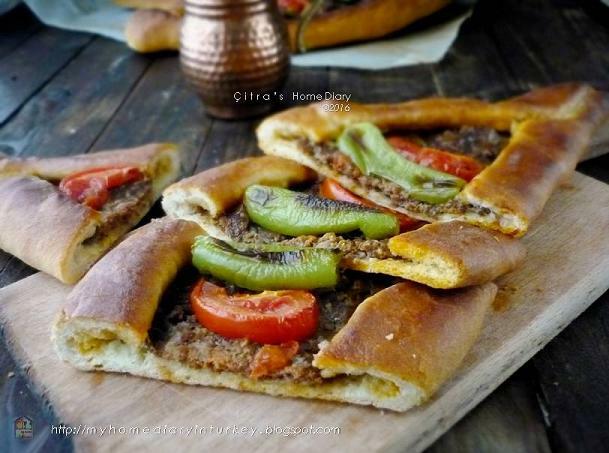 Pide also refers to another pizza-like food made of pide dough topped with different ingredients. 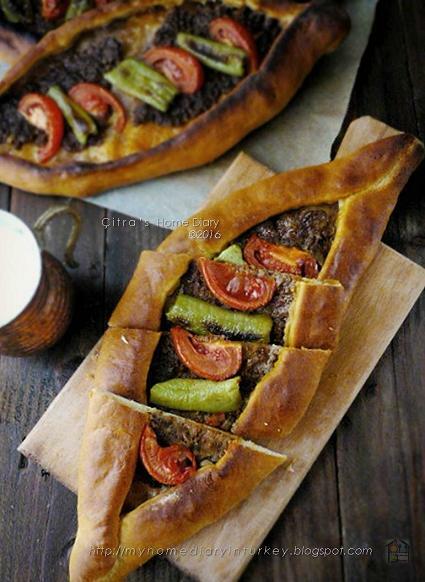 With distinctive charcoal aroma from traditional stone oven, makes this pide is a "must try food" when you visit Turkey. Regional variations in the shape, baking technique, and topped ingredients create distinctive styles for each region. Such pides can include chicken, beef, cheese, potatoes, garlic and many other ingredients. Beside Pide with chicken topping, Turkish sausage topping, and pide with cheese and egg topping, today I'll share my post Kıymalı Pide or pide with ground meat topping. This is slightly different from my previous Kıymalı Pide I made before. And you can choose ayran for beverage accompany this pide. For recipe in English please visit here. 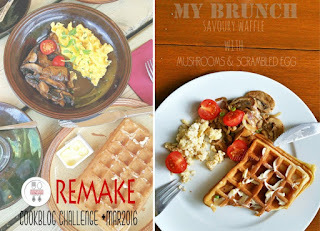 Postingan hari ini it's all about remake... Maksudnya bikin ulang makanan yang biasa kita nikmati di restoran. Karena tulisan ini saya sertakan untuk Indonesian Food Blogger Food Challenge dengan tema "Remake". Untuk kalian para foodie yang pengen join challenge food bulan Maret ini bisa gabung di link Idfb sini. Well... membuat makanan homemade bukan lagi hal yang jarang saya lakukan. Sejak tinggal di sebuah kota bernuansa tradisional dimana rata rata masyarakat lokal terbiasa menyajikan produk homemade bagi keluarga. 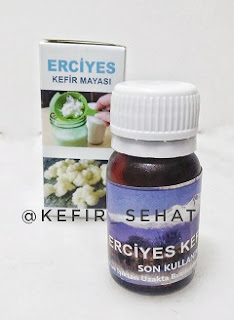 Dan hampir semua yang tersaji di meja makan keluarga Turki adalah hasil olahan sendiri, maksud saya SEMUA! Serius. Mulai dari yogurt, keju, pasta tomat, pasta cabe, pickles/ acar, mayonese dan produk olahan lainnya. Kita senang sekali membuatnya di rumah! 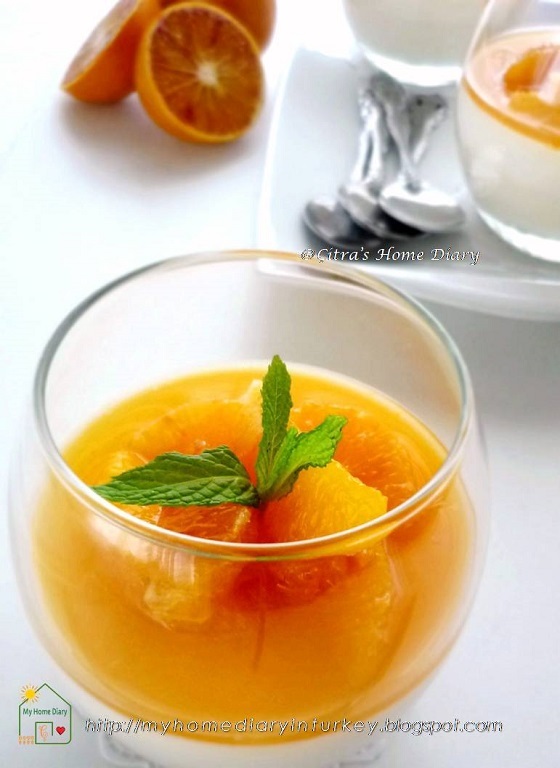 If you see my recently posts are orange-y .... yellow or orange color..sometime mix with chocolate.... cause there is no other reason other than because I love citrus! And don't you think it also festive the spring, isn't it? And this blood orange is so trending in my local market. Every where I saw many booths selling this orange with cheap price.. I think it's citrus peak. 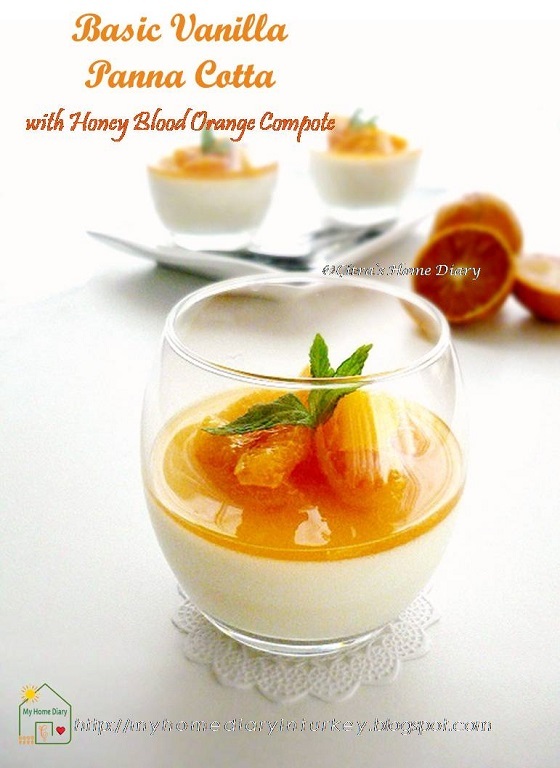 You can find my recipe using this lovely color fruits start from main dish to dessert in "Orange" Ingredients list. 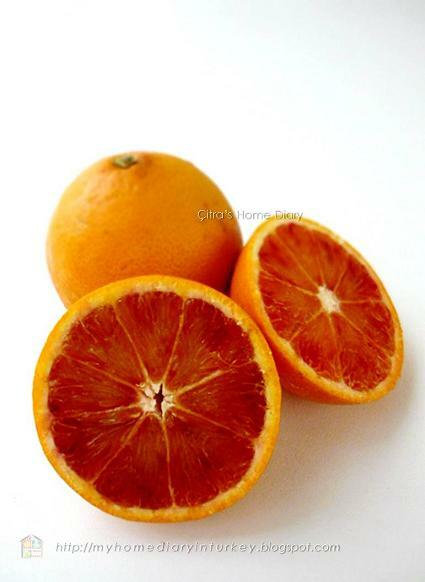 The color of this blood orange is dark orange almost red. It's catch my attention maybe because I never find this kind of orange in my homeland... find more about blood orange here. In some Asian blogger fellows I saw many posts about ogura cake. Did you hear about Ogura cake? Ogura cake, aka 相思蛋糕 / Xiāngsī dàngāo . No official sources why this cake name Ogura (Japanese language). Is it coming from Japan or invented in Japan or whatsoever. It's just this cake become very popular among Asian baker and Asian cake lover. The texture incredibly cotton soft, light, smooth texture. Rich in flavor yet light in sweetness. 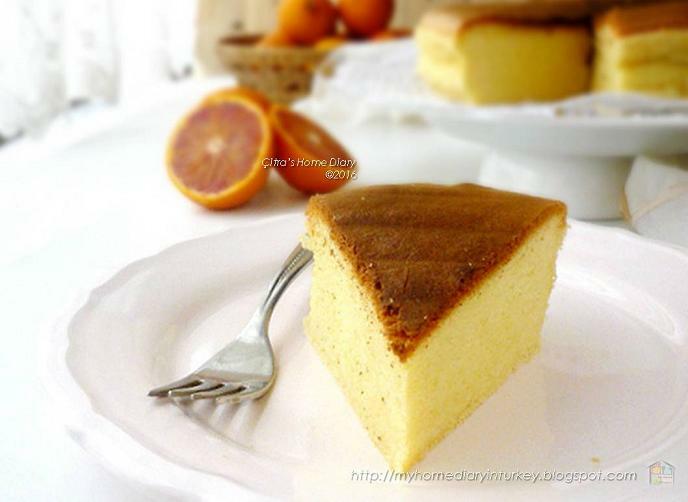 The method for making this cake same as making chiffon cake using separated yolks and egg white method. The only tiny different is using additional 1 whole egg into yolk batter. The rest are exactly same as chiffon including invert the cake during cooling time. For this ogura you may use any pan you like, round or square or even tube pan. Yep... It's chiffon cake again. Do you know why? because this cake such and delicious, soft, and light cake to eat. Not easily make you full on stomach..so guess next...everybody wouldn't take only 1 slice! So chiffon cake in my house never survive more than 2 days. Even my mom plants two kind of pandan (aromatic pandan and pandan suji) in our small yard. Aromatic pandan (we call it pandan wangi) mostly has larger leaf than pandan suji and give wonderful aroma in your meal/ dessert. Pandan suji has smaller leaf, it gives strong and nice green color in your meal/dessert, the aroma not really fragrant as aromatic pandan. 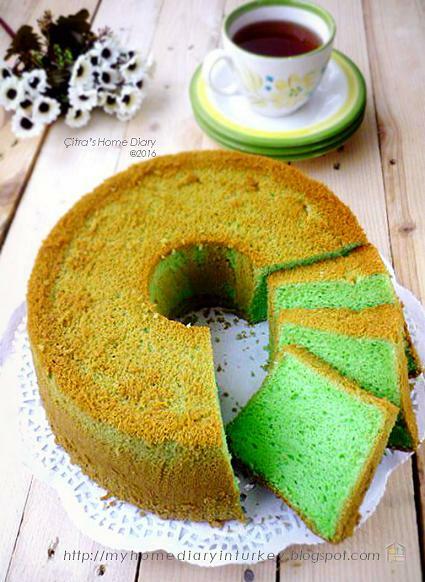 And for today's pandan chiffon cake I took recipe from Sajian sedap, one of biggest cooking magazine in Indonesia. And here I re-write the recipe. If you are big fans of coconut...welcome to my boat. If you are hearty in love to macarons.... come and join me. Ever since I successfully bake some macarons from last year, I get hooked! Baking them and eat them. The delicacy of it's taste and cute in shape is just so beautiful and pretty on camera, don't you think so? So after passing "bitter time" dealing with fails macarons, now I'm in the middle of my "journey" to find variety of flavors for my macarons. 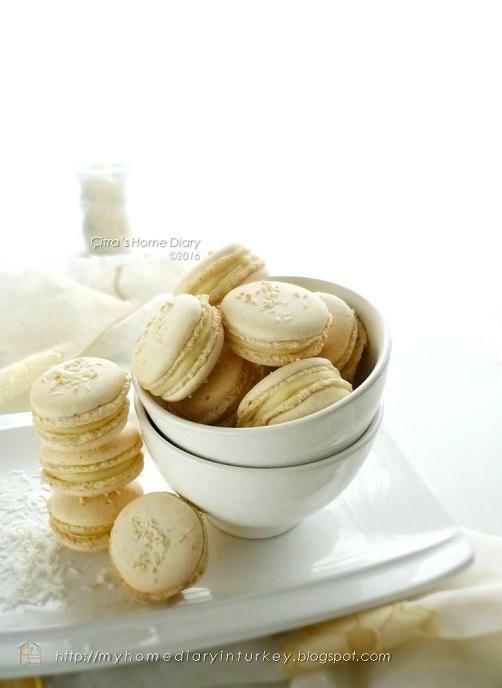 You can check my other macarons recipes to see what flavors I made previously. hahahha.. I just exaggerate it. But honestly I'am talking real story here. Especially anything you need to make your own homeland food isn't available locally or it's very difficult to find. 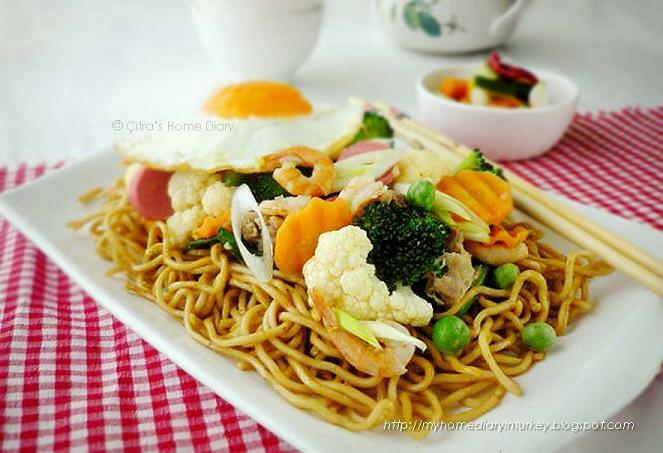 I remember earlier years I'd staying here, it was around 2008 or 2009, even egg noodle was very difficult to find. I must went to big chain supermarket (where far away from my house), then sometimes I got painfully heat broken cause couldn't find it there. When I got lucky, my husband surprisingly brought it for me from another big supermarket near his office. To buy soy sauce, we must buy it online which sometimes also no stock.... Yes...that was my earlier year living in Turkey. Maybe local people are't familiar to Asian culinary. And years gone by.. and I was so happy cause some ingredients I need to make my own style food become easier to find here.. don't know why..maybe Asian foreigners getting more settled here..😄 dunno! I like Korean food in moderate way, I like it cause some (some-not all) Korean food are acceptable by my asian tongue. Kimchi is my favorite one. I make kimchi once or twice in a year when I saw napa cabbage at local farmer market--even some friends of mine ordered Kimchi from me, they like my homemade Kimchi ^,^. Thank you girls! 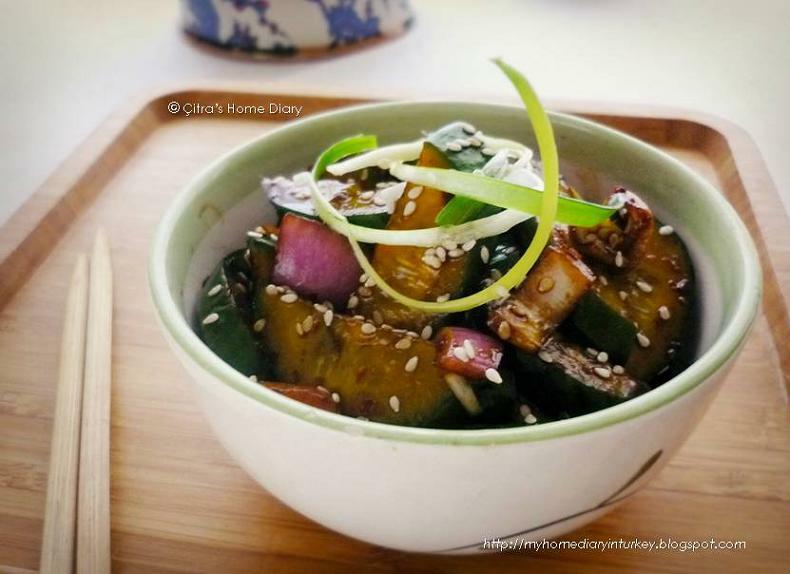 It call Oi-muchim or spicy cucumber. Still playing with orange flavor here.... yess... if you are citrus lover, join with me in this simple Orange yogurt mini cake. 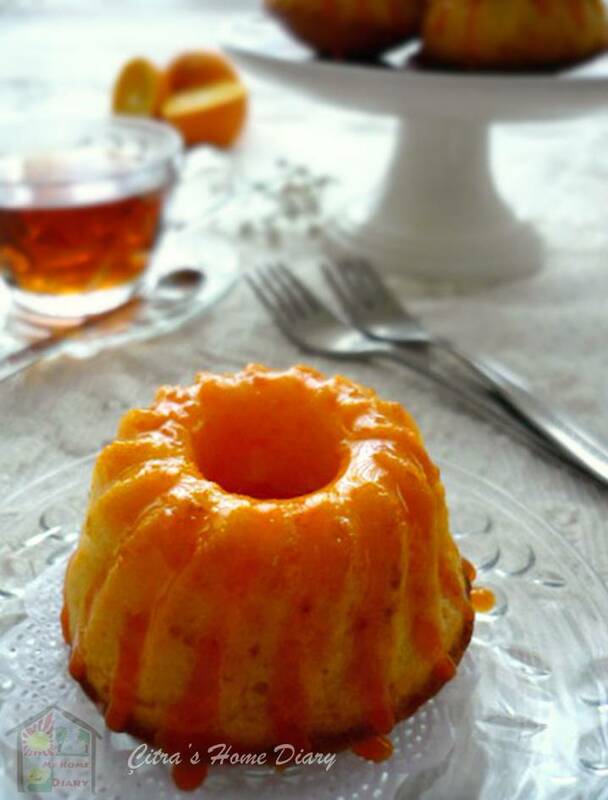 I serve these cute yummy cake with bright orange glaze. Yoghurt cake is also very familiar here in Turkey. We use yogurt a lot in our cakes, dessert, snacks, soups and even in other main dishes. 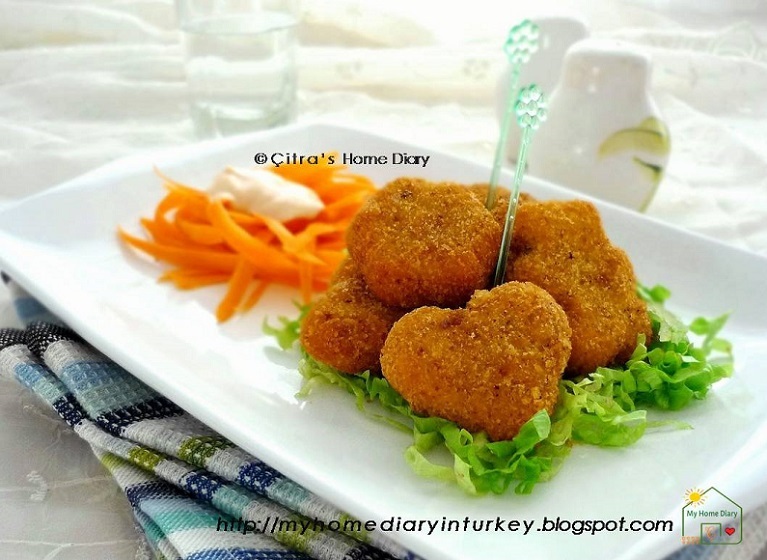 Making this mini version is just helps you simple to serve them with your friends or family members during coffee or tea time. If you want to make big cake version, use 1 loaf pan (25x10cm) with adjustment on baking time. Just with skewer inserted in middle of cake to check whether cake is done. 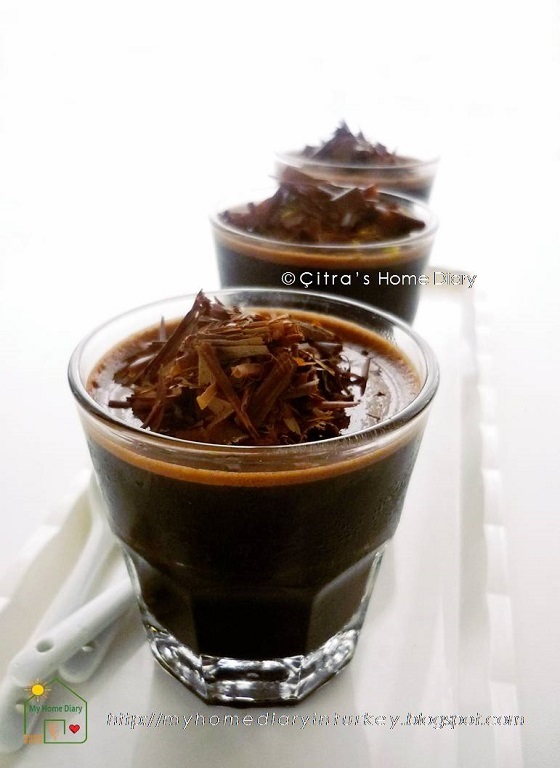 For our weekend dessert I made this fabulous and delicious Dark Cocoa Panna Cotta. The recipe I took from Donna Hay's recipe with minor adjustment. Well, mostly I am a person who strict to the original recipe... but I think you'll agree with me that coffee is chocolate's best friend, right? So, for my personal adjustment I skipped the vanilla and use coffee granule instead. The final result was superb! I can taste the coffee flavor infuse to the panna cotta nicely. Not strong though but soft enough to indulge your taste...believe me, you gonna love it! Actually it's my second time making this dark cocoa panna cotta. At 1st making I used exactly like what recipe write without any adjustment/ change at all. I used vanilla essence instead of coffee in first trial. The taste was so great, I liked it though, may family liked it as well. But the texture slightly too soft for me, so for this second trial I add gelatin powder. Original recipe calls for 3 tsp gelatin powder, I add 1 tsp today and it turns out very nice smooth texture. Exactly like what I prefer. Yet the taste isn't simple as make it. 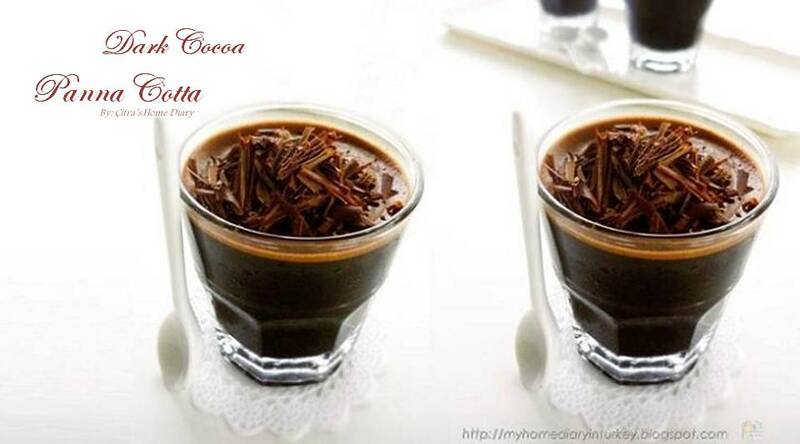 Silky soft and very chocolaty- you never imagine this made from cocoa powder instead of cooking chocolate. Surabaya is capital city of East Java province in Java island, also well-known as one of famous culinary destination in Indonesia. 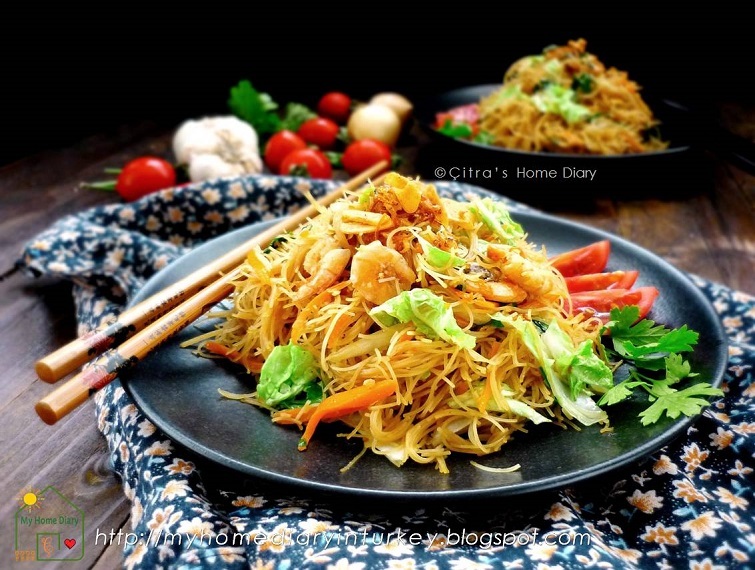 Yes, when you visit Surabaya you'll find widely various of delicious foods-traditional or even international. And like as many other Asian cities, Surabya is also paradise of street food which mostly open almost 24 hours or start at evening. I am originally from Surabaya, so I know what kind of food you should try and where is the best around my city. Among many famous foods, there is one which I will share today. Nasi Udang ala Bu Rudi. Nasi means rice, Udang means shrimp. Bu Rudi or madam Rudi is founder/ owner of the restaurant that serve this food. 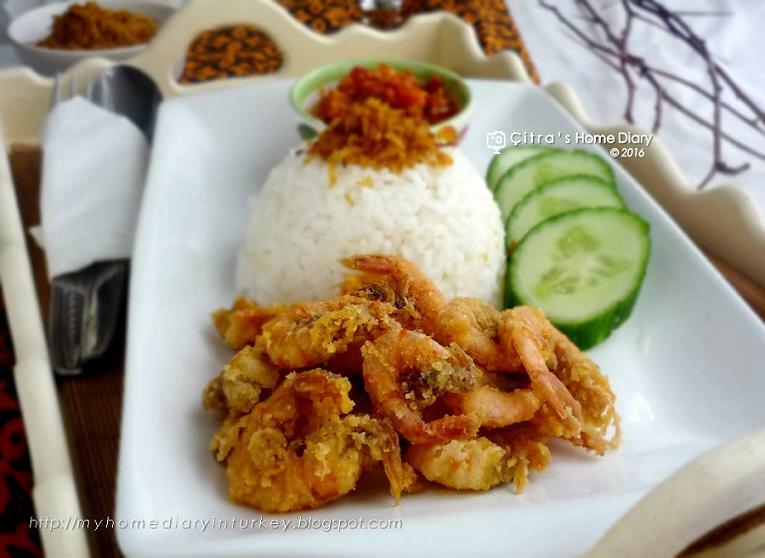 The dish consist of white steam rice, crunchy fried shrimp, chili sambal, serundeng kelapa (spiced shredded coconut) and some fresh cucumber and Indonesian basil/ kemangi. The typical of this famous menu is the extremely hot spice of it's chili sambal. I am talking very very seriously hot- even for some local people. You know east java food especially Surabaya's food famously spicy and hot in taste. But you can make your own sambal as your liking. If you have culinary adventurer in your blood, you should try to come to my homeland Surabaya. Or just bookmarked my recipe for you to make at your kitchen.